The atmosphere is friendly and relaxed so whether you’re after a romantic dinner, a work or family celebration, a glass of wine and a snack, or simply a coffee and pastry, we’re a great choice. We’ve spent many a long night developing our wine list which features around seventy bottles of wine and champagne, with many available by the glass. Aperitif’s, digestif’s, charcouterie, fromage, camembert, crème brulee…we could go on…and do! We run special menus on special days; available at all our Bistros. Click on the individual sites for more information. 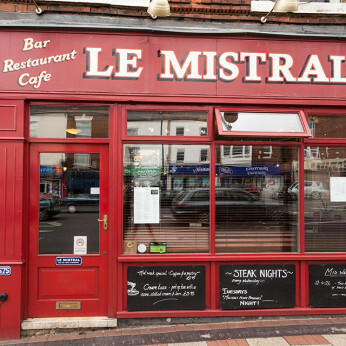 We're really sorry but we don’t seem to have any offers or events for Le Mistral. We're sure there must be something happening here but they just haven't told us about it! Please do mention this to Le Mistral when you next visit them.